(by Thomas Sowell, National Review) – Words seem to carry far more weight than facts among liberals who argue as if rent-control laws actually control rents and gun-control laws actually control guns. It does no good to point out to them that the two American cities where rent-control laws have existed longest and strongest – New York and San Francisco – are also the two cities with the highest average rents. The problem with polls, in dealing with an empirical [actual; factual] question like this, is that you can only poll survivors. Every surviving business in an industry might have as many employees as it had before a minimum-wage increase – and yet, if the additional labor costs led to fewer businesses’ surviving, there could still be a reduction in industry employment, despite what the poll results were from survivors. Since employment varies for many reasons other than a minimum-wage law, at any given time the effects of those other factors can outweigh the effects of minimum-wage laws. In that case, employment could go up after a particular minimum-wage increase – even if it goes up less than it would have without that increase. It is surely no coincidence that during the last administration in which there was no federal minimum wage – the Calvin Coolidge administration – unemployment ranged from a high of 4.2 percent to a low of 1.8 percent over its last four years. It is surely no coincidence that, when the federal minimum-wage law remained unchanged for twelve years while inflation rendered [made] the law meaningless, the black teenage unemployment rate – even during the recession year of 1949 – was literally a fraction of what it has been throughout later years when the minimum-wage rate was raised repeatedly to keep up with inflation. Posted at NationalReview.com on January 22, 2014. Reprinted here January 23, 2014 for educational purposes only. May not be reproduced on other websites without permission from National Review. Visit the website at NationalReview.com. 1. 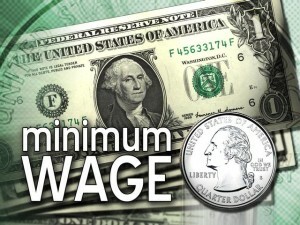 What are minimum wage laws? 2. What is the main idea of Thomas Sowell’s commentary? 3. The purpose of an editorial/commentary is to explain, persuade, warn, criticize, entertain, praise or answer. What do you think is the purpose of this editorial? Explain your answer. b) Do you think he has a persuasive argument? Explain your answer.